Nasiriyah Airport (IATA: XNH, ICAO: ORTL) is a Military / Public located near Nasiriyah, Iraq. It is also known as Tallil Air Base until December 2011 and Imam Ali Air Base Until March 2017, when the base was used by United States Armed Forces. It is generally known as Camp Adder by the U.S. Army; the name "Ali Air Base" is used chiefly by the U.S. Air Force; the installation, however, is still commonly referred to as "Tallil". The base occupies 30 square kilometers and is protected by 22 kilometers of security perimeter. 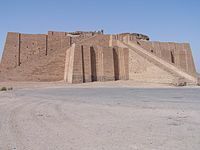 The ancient Babylonian city of Ur, known as the birthplace of Abraham, is located within the security perimeter for Ali Base, and its ancient ziggurat is visible from nearly every area of the base. Talil Air Base was an Iraqi Air Force base. The airbase was bombed in Operation Kaman 99 on the second day of the Iran–Iraq War, just after the Iraqi invasion of Iran. The air base served as the home of a unit of Soviet-built MiG fighter aircraft as well as several Mi-24D (Hind-D) helicopter gunships. The aircraft could be serviced and stored in fortified concrete aircraft hangars located at either end of the main runway. These aircraft shelters, sometimes referred to as "trapezoids" or "Yugos", were built by Yugoslavian contractors sometime prior to 1985, and according to the Gulf War Air Power Survey, there were a total of 36 aircraft shelters in 1991. It is possible that Sukhoi Su-20's may have been located at the base at some point during this period. During the 1991 Gulf War, the base and its fortified aircraft shelters were heavily damaged by Coalition bombing missions. After the ground campaign began, elements of the U.S. Army 24th Infantry division Mechanized took the base after fierce opposition from an entrenched force of the 45th and 37th Iraqi infantry divisions. After the initial engagement and defeat of enemy forces the 24th required a security force to continue to hold this piece of key terrain. The original plan was for elements of the 101st Air Assault to take up this position. However with those elements being engaged further to the west this wasn't possible for several hours. It was later turned over to the 82nd Airborne division of the U.S.Army. While the initial forces had been dealt with by the 24th ID(Mech) pockets of light resistance still remained and would mount small attacks. The original plan for Tallil was that it would be used as a resupply point for coalition forces. Therefore,it was vital for the 82nd to hold this until reinforcements could be brought up to help maintain the security of this very large airfield. U.S. Combat Engineers continued to destroyed whatever serviceable aircraft and ordnance was missed during the earlier air campaign. After the start of the Iraq War in 2003, Talil, now known as Ali Air Base, was used by the U.S. Air Force 332d Air Expeditionary Wing before they moved to Balad Air Base in January 2004. The 726th Maintenance Battalion (Massachusetts) arrived in May 2003 to operate as the Mayor cell for LSA (Logistics Support Area) Adder. The 407th Air Expeditionary Group, operating C-130 Hercules cargo airplanes, then utilized the base and trained more than 100 Iraqi Airmen on how to maintain and fly the C-130 type until February 2006. These trainees were then designated the Iraqi Air Force 23rd Squadron and relocated to Kirkuk Air Base. Units from various Coalition groups have used designated sections of Ali Air Base during the course of the occupation. Camp Terendak was used by Australian troops until the Australian Battlegroup withdrawal on June 1, 2008. Romanian troops used Camp Dracula until the Romanian Army withdrew in the summer of 2009. Camp Dracula was then used as the "Regional Center of Excellence for Civil Capacity". Ali Air Base was thereafter used primarily by U.S. forces, including elements of the U.S. Army, Air Force, the Navy, and the Marine Corps. Camp Adder, used by the Army, was also the home to three Provincial Reconstruction Teams for the provinces of Dhi Qar, Muthanna, and Maysan. The Dhi Qar team was led by Italian personnel, while the Muthanna and Maysan teams were headed by U.S. State Department officers. The U.S. Army Corps of Engineers Gulf Region District managed these and most other construction projects, from start to finish, 34 airfield support squadron of the (elite) British Royal Engineers, built accommodation and repaired the runways to make them operational for use by the American airforce during operation Iraqi freedom. The base was nearly vacated of all US Forces on 16 December 2011. The 20th Engineer Brigade, serving as the COB Adder Mayor Cell and Theatre Engineer Brigade, led and managed the transition of the final US base in Iraq. The closure of this base and the later movement of the remaining US Forces to Kuwait were the final actions in Operation New Dawn, the successor mission to Operation Iraqi Freedom. While the U.S. military used the base during the Iraq War (2003–2011), there were various amenities for the troops stationed there, such as a large post exchange and restaurants such as Pizza Hut, Burger King, Taco Bell, Ciano's and a Green Beans coffee shop, but these were closed as of October 7, 2011. Three dining facilities operated by KBR provided hot food for the troops, U.S. government civilians and contractors working on the base; they also closed and MRE's were the only option for food. The base also boasted a large chapel and a Morale, Welfare and Recreation (MWR) facility. A private contractor, SniperHill, provided commercial internet service but the highest speed available was 256k at a cost of $110 per month. Most Army personnel living on the installation lived in containerized housing units, affectionately known as CHU's, as opposed to conventional tent quarters. There were, however, at least several Army units, as well as all USAF personnel, that occupied tents on the base. The airfield is served by two main runways measuring 12,000 and 9,700 feet. A modern air traffic control tower was completed in March 2010 to further increase the airfield's capabilities. An instrument landing system was installed to provide CAT 1 service to the 30R approach and was planned to be operational by the end of April 2010. The airfield lighting system was also upgraded as part of the airfield modernization program. Operation Night Harvest was the uncovering of abandoned aircraft at Tallil AB. United States forces found a large junkyard of derelict Iraqi aircraft. Airport information for ORTL at World Aero Data. Data current as of October 2006. This page was last edited on 22 March 2019, at 02:19 (UTC).